IndiSMS is a mobile application from Eterno Infotech Pvt. Ltd. 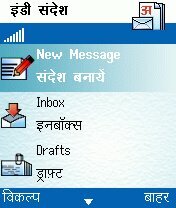 This application allows users to send and receive messages in 9 different Indian languages. The supported Indian languages are Hindi, Marathi, Punjabi, Gujarati, Bengali, Kannada, Malayalam, Tamil and Telugu. You can send SMS with the same phone, same keypad BUT in INDIAN language. IndiSMS 9 Language version for series-60 phones. The supported Indian languages are Hindi, Marathi, Punjabi, Gujarati, Bengali, Telugu, Kannada, Malayalam and Tamil. The messages are sent in International standard “Unicode” text format and are compatible with most of the handsets sold in India. IndiSMS is very easy to use and download. It is available for both Symbian and Java versions. I need activation code for indisms …how can i active this application? .-= car purchase´s last blog ..Used cars- not tricky to buy =-.